Glenavon’s commitment to youth development stands at the heart of the high-flying start to the Danske Bank Premiership season - in the view of manager Gary Hamilton. The Lurgan Blues return to league play this weekend with a trip to tackle Glentoran following a break due to international commitments with Northern Ireland under 21s. Glentoran assistant manager Gary Smyth. Pic by INPHO. Mark Sykes’ selection and a spot on the stand-by list for Caolan Marron served to postpone the scheduled game against Cliftonville. 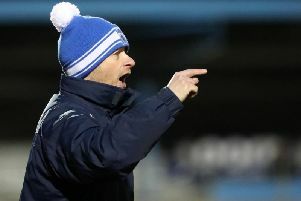 Hamilton feels his on-song players are keen to keep up the momentum which has pushed Glenavon into second spot. “When you see the international situation with Mark and Caolan that is a credit to the players and the club,” said Hamilton. “I think we counted seven players now from our system with caps for Northern Ireland under 21s. “I look at our 10 outfield players this season and often we can highlight seven under the age of 23 years old in the side, so that gives you energy, pace and high fitness levels. “Team spirit is excellent too and I rate this current changing room as probably the best in my time. “You see the support for the starting side provided by the substitutes’ bench and that shows me something about this season’s squad. “We handed the players a night off last week but then got back into sessions last Thursday and Saturday, plus the normal Tuesday and Thursday routine for this week. Glenavon’s September clash at home to Glentoran finished with honours even but sparked a five-game maximum haul of points heading into the Oval. Glentoran host Glenavon aiming to bounce back from back-to-back league defeats that signalled the end of a seven-game unbeaten run across the Danske Bank Premiership. The derby blues off a single-goal reverse to Linfield carried into Saturday’s Seaview setback when Crusaders sealed a 3-0 win. “Any plan went out the window by conceding so early to Crusaders but we feel that goes down as the first time this season we’ve capitulated, it was just a bad day,” said Gary Smyth, the Glentoran assistant manager. “We deserved at least a draw I feel from the Linfield match and the goals conceded to Crusaders were so avoidable, so it is about taking responsibility. “Overall, we’ve made a decent start and you just need that bit of luck, the right rub of the green for things to click as it seems every mistake is punished at present. “But you look at someone like Elliott Morris last weekend, who held his hands up after Crusaders’ first goal but has so often across his career saved Glentoran as just a fantastic player. “We are expecting a good atmosphere at The Oval for the Glenavon game on Saturday and have Curtis Allen back in training but Marcus Kane is suspended and Conor Pepper struggling with groin trouble. “Glenavon are full of young and hungry players and we are driving towards that same way of working.